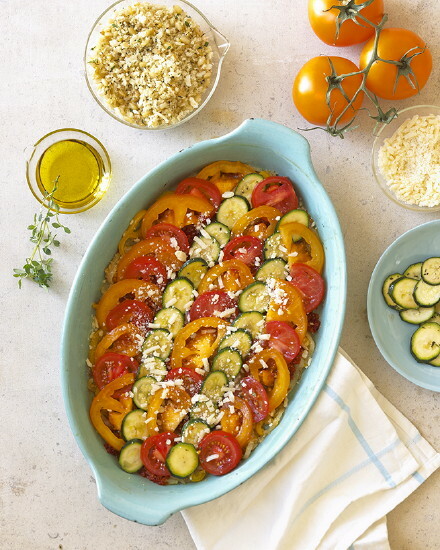 Mom’s Favorite Fourth of July Veggie Recipe – A Gratin with Tomatoes and Zucchini, Of Course! It’s always a good sign when your mom tells you she’s dog-eared the pages of your new cookbook. 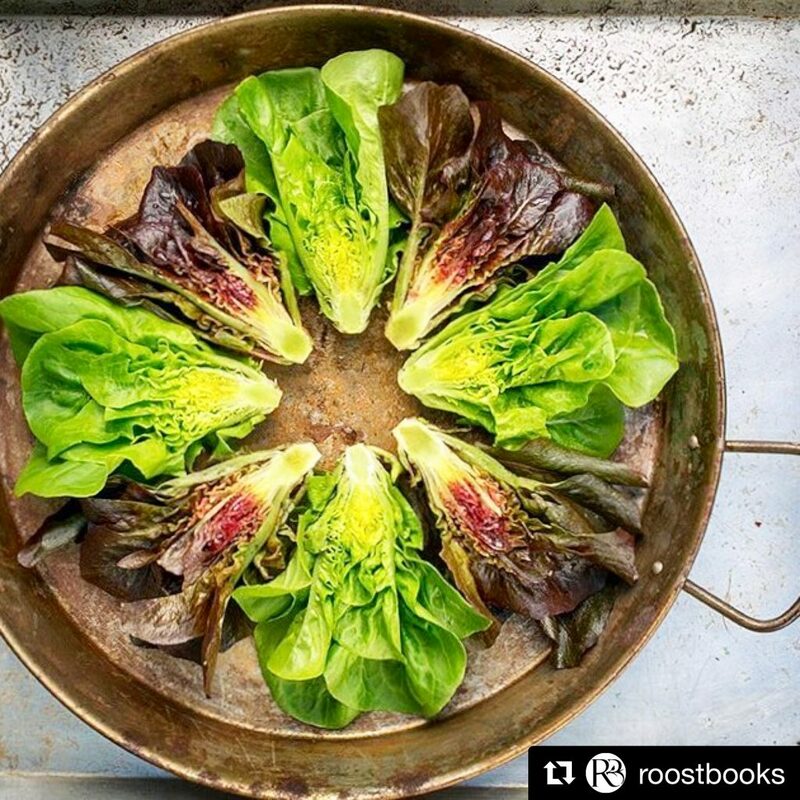 When I sent my mom, Pauletta, an early copy of The Fresh & Green Table, she sat down and went through every page, marking all kinds of recipes she wanted to try. Yay! I thought. I must have a hit on my hands if Mom likes it. First she made the Tuscan Kale and White Bean soup for my Dad, and then… well, I had to laugh at her next choice. It’s a variation on something I’ve made and she’s made many times over since I started creating veggie dishes after culinary school so many years ago. In fact, it’s a dish that is unsurpassed in popularity among my friends. 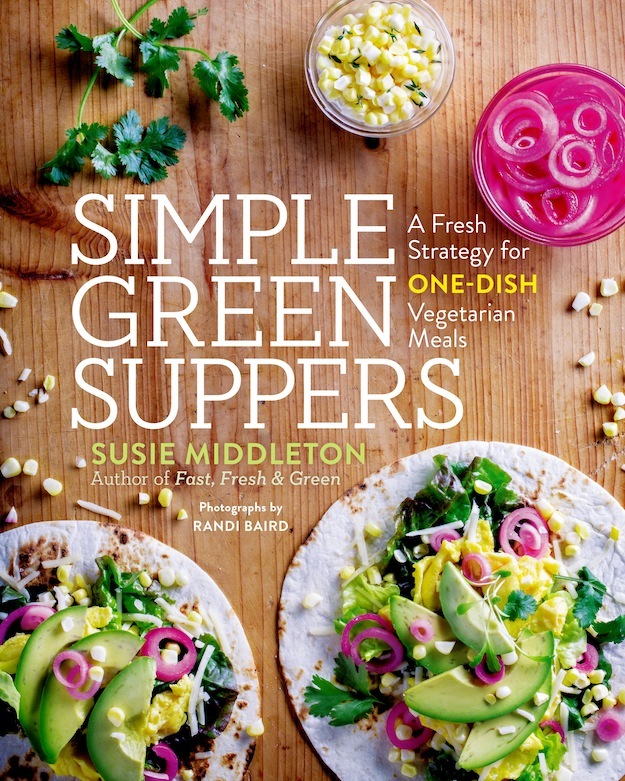 Even my cookbook editor, Bill LeBlond at Chronicle Books, who has edited hundreds of cookbooks over the years, makes my recipe from Fast, Fresh & Green frequently for parties. What is it? It’s basically a layered vegetable gratin, but in France it is called a tian for the type of shallow baking dish it is baked in. 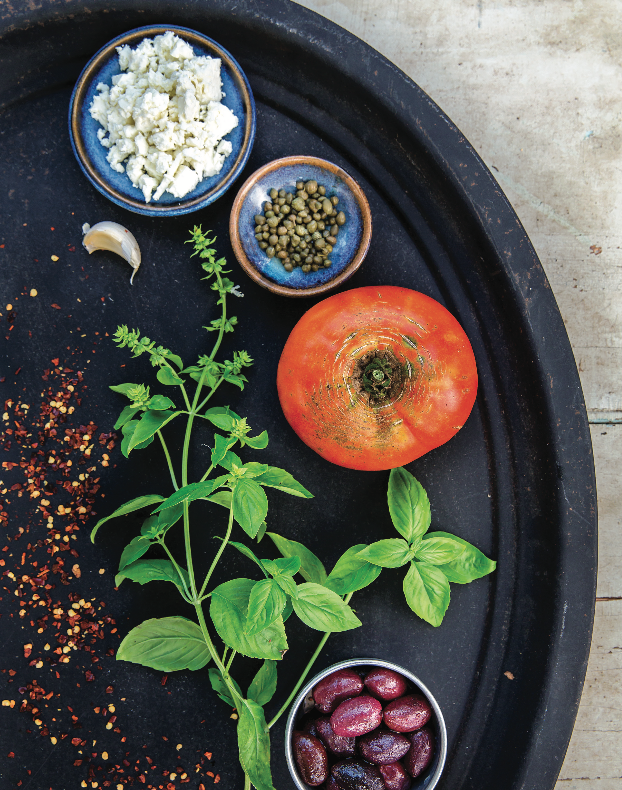 A tian often features zucchini and tomatoes in the summer, but I also make them with eggplant and tomatoes, with potatoes and tomatoes, and with lots of different herbs and a variety of cheeses and crumb toppings. I take special care with a bottom layer of sautéed onions, leeks, bell peppers, garlic, fennel or other aromatic vegetables so that when the tomato juices seep down to the bottom of the pan during cooking, they combine with those aromatic veggies and herbs to make delicious flavor. My other tip for the best tasting tian is not to undercook it! During the first half of cooking, the tomatoes shed a lot of liquid, but then the liquid begins to reduce and becomes incredibly flavorful, so the dish needs time in the oven for this to happen. 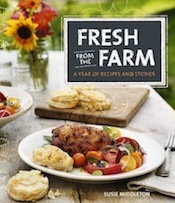 The variation I included in the new book is especially tasty (Mom and Dad loved it), so I’m offering it to you today in case you’re in the throes of planning your fourth of July menu. Also, I am feeling kind of sentimental, wishing I could be with my family this holiday. Many years we gather in Delaware this time of year to celebrate all our family birthdays together, but this year, of course, Roy and I are too busy to go anywhere! I’m happy that my sister Eleanor will be with Mom and Dad on this holiday and I bet you I know one thing they’ll be cooking! P.S. The beautiful photo (top)—one of my favorite, in fact, of the many lovelies Annabelle Breakey took for The Fresh and Green Table—actually shows the tian being assembled a little differently than my directions call for. (There’s a funny story there, but another time.) It really doesn’t matter, but in case you’re trying to compare the directions to the photo, know that I arrange the veggies in rows going across the pan, not up and down the pan. Either way you do it, it will be delicious. I love to cook this in my enameled cast-iron Le Creuset oval gratin dish, because I think the cast iron conducts heat so beautifully that the juices get extra caramelized. But other 2-quart shallow baking dishes, like a 9 x 7 Pyrex, will work fine, too. 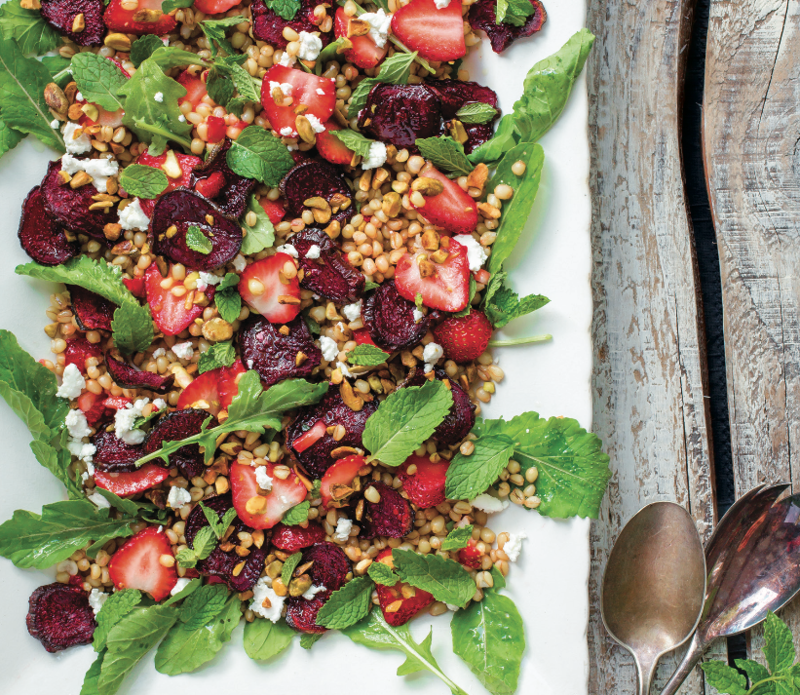 Take this dish to a potluck or picnic. It will be a hit, I promise. But if by chance you wind up with any leftovers, you’ll love those too, as it tastes great the next day. Preheat the oven to 375 degrees F. Rub a shallow 2-quart baking dish with a little olive oil. 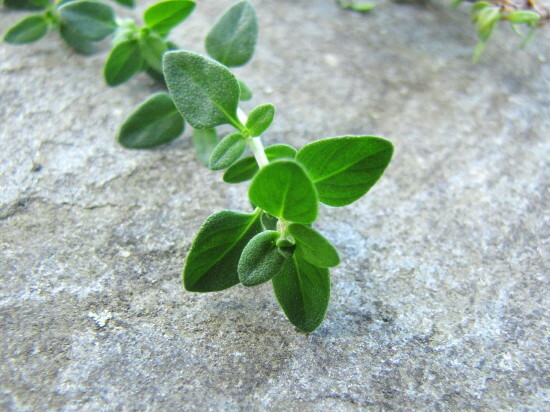 In a small bowl, combine the pine nuts, the bread crumbs, 2 tablespoons of the Parmigiano, 1/2 teaspoon of the thyme, and 2 teaspoons of the olive oil. Mix well. Whisk together the balsamic vinegar, the honey, 2 tablespoons of olive oil, and 1/4 teaspoon salt. Put the zucchini slices in one bowl and the tomato slices in another. Add a pinch of salt and 1 teaspoon thyme to each bowl, and drizzle half of the balsamic mixture over each. Toss gently. Let sit while you prepare the rest of the recipe. In a medium (10-inch) heavy nonstick skillet, heat 1 tablespoon of the olive oil over medium heat. Add the onions, the peppers, and 1/4 teaspoon salt. Cook, stirring frequently, until the onions and peppers are limp and the onions are golden brown, about 10 to 12 minutes. Stir in the minced garlic and cook until softened and fragrant, about 30 seconds. Transfer the onions and peppers to the baking dish and spread them evenly in one layer across the bottom. Let cool slightly. Sprinkle the sundried tomatoes and the remaining 1/2 teaspoon of the thyme over the veggies. Starting at one narrow end of the baking dish, arrange a row of tomato slices across the dish, propping the slices up against the end of the dish at an angle as you go. Sprinkle a little Parmigiano over the row of tomatoes, and then arrange a row of zucchini slices, slightly overlapping each other and slightly overlapping the row of tomatoes. Again sprinkle Parmigiano on that row, and continue to arrange rows of tomatoes and zucchini, each sprinkled with Parmigiano, until you get to the end of the dish. You should have just about the right amount of zucchini, but don’t worry if you have extra slices. You will definitely have extra tomato slices (and ones that you’ve chosen not to use because they’ve fallen apart!) But as you are going along, if it looks like you will have a lot of extra, gently push the rows back up towards the end of the dish you started at to make room for a few more rows. Scrape any remaining seasoning and juices from the bowl the zucchini was in over the veggies. (Leave the extra tomato juices behind or use them in a gazpacho!) Sprinkle any remaining Parmigiano over the veggies. Drizzle the remaining 2 tablespoons of olive oil over the veggies, and top with the bread crumb-pine nut mixture. Bake until well browned all over and the juices have bubbled for a while and reduced considerably, about 65 minutes. Let cool at least 15 minutes before serving. 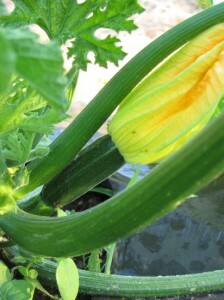 Our first little zucchinis appeared on the scene yesterday. 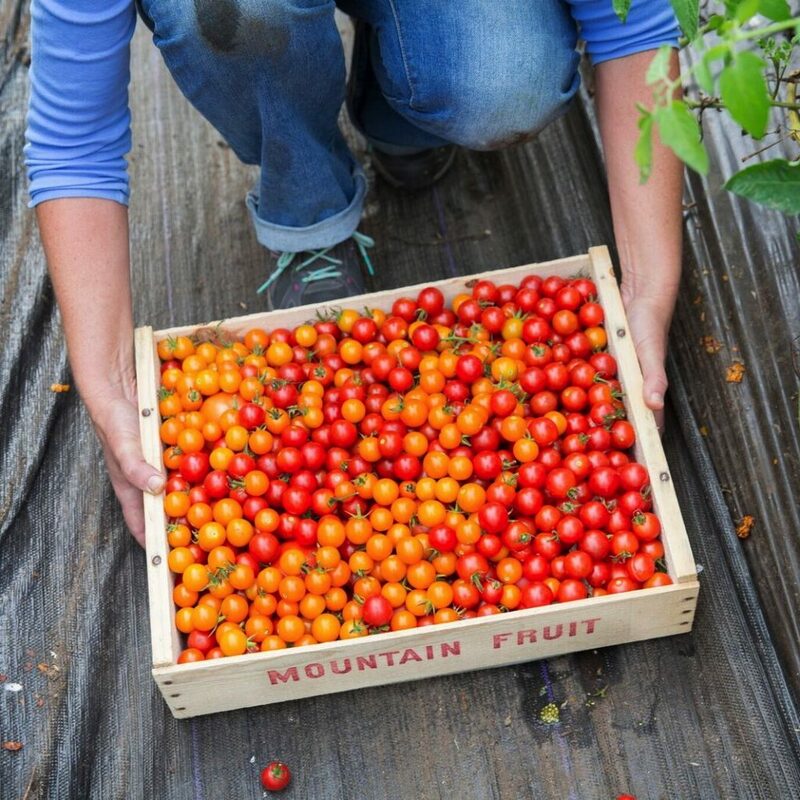 We picked them, put them out at the farm stand, and someone bought them. Yeah, I know. That won’t last forever. There will come a time, say mid-August, when you won’t be able to give away a summer squash, they’ll be so ubiquitous. Just don’t do what I did a few years ago and try to feed them to your dog. (Poor Gus.) 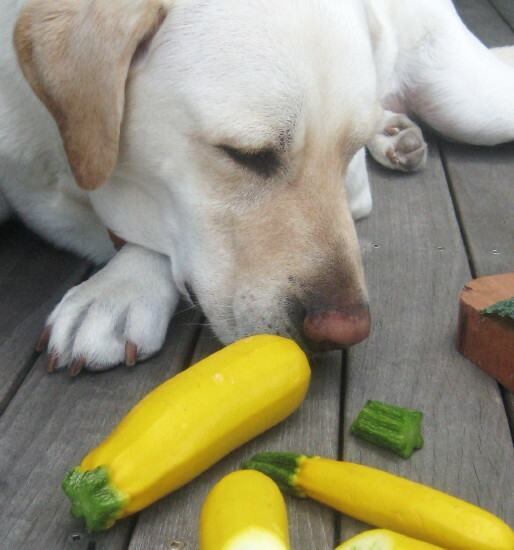 Honestly, there are plenty of delicious things to do with summer squash, and I’m determined to convert a few squash-bashers (that’s you Katie and Eliza) this summer with a couple of my recipes. 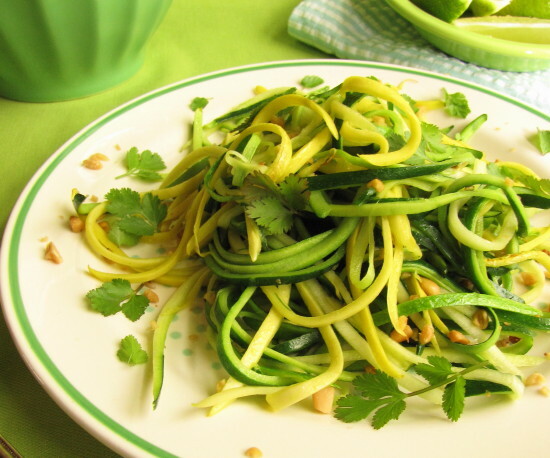 The zucchini ribbons need only a quick toss in a hot sauté pan to be perfectly cooked—tender, but still al dente (sort of like linguine!). I like to make a little brown butter in the pan first, and to finish these sautés with a squeeze of lemon or lime, a few chopped toasted nuts, and a smattering of chopped bright fresh herbs like mint, cilantro, basil, or tarragon. There’s a version of this recipe in Fast, Fresh, & Green with lemon and hazelnuts, but the one I’ve included here (below) has a nice combination of lime, cilantro and mint. 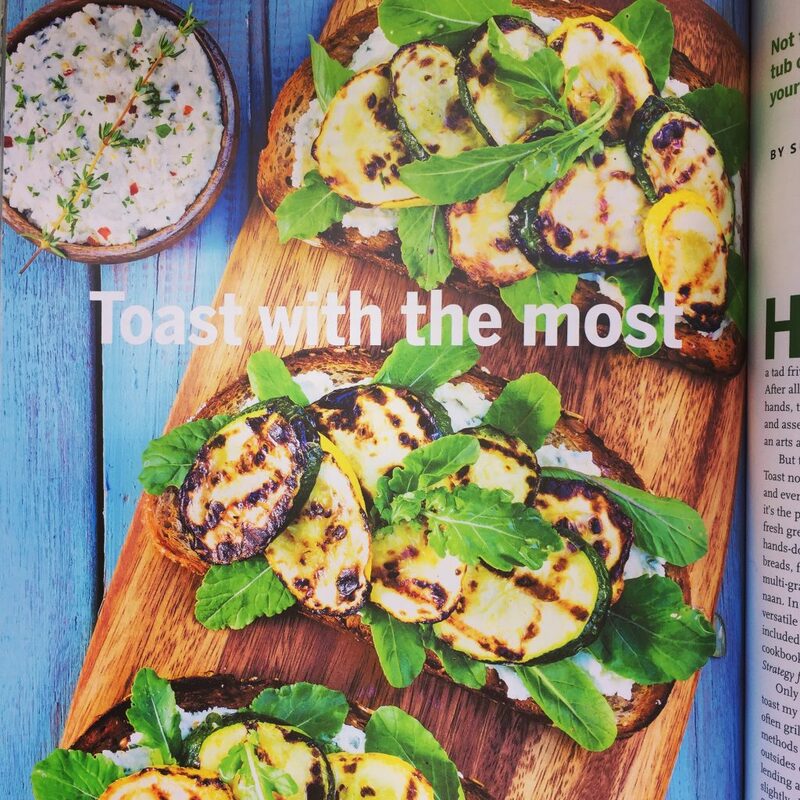 I’ll post more squash recipes as the summer goes on, but I also suggest that you check out the new issue of Fine Cooking magazine (August/September, on newsstands next week) which has a beautiful zucchini story written by my cook-farmer friend Mary Ellen Driscoll. It includes a recipe for fried squash blossoms. It takes a few peels to get the hang of the julienne peeler. I like to run the peeler all the way down the length of the squash for the longest pieces, but it’s easier on the fingers to hold the squash at one end and peel half way down and then flip it around and do the same thing. The shorter ribbons are just as pretty as the longer ones. Whatever you do, discard the core—you want most of your ribbons to have a bit of skin on them for the best texture. Set out a large mixing bowl. Working over the bowl, peel the squash lengthwise with the julienne peeler into thin strips. Work all the way around the squash until you get to the thick seed core. Discard the core. Break the strips up with your hands, as they can tend to clump together. In a large nonstick skillet, heat the butter over medium-high heat. When the butter has melted, add the smashed garlic clove and cook, occasionally flattening the garlic clove with a spatula, just until the butter and the garlic clove start to turn a light brown. Remove the garlic. Add the squash strips and the ½ teaspoon kosher salt and cook, tossing with tongs, just until the squash have become pliable, about 1 minute. Remove the pan from the heat and add the lime juice and most of the chopped nuts and herbs. Toss well. Taste and season with more salt if desired. Serve garnished with remaining nuts and herbs.